Since 1999, the Bozzini Quartet has been an original voice in new, contemporary, experimental and classical music. Their skew is radically contemporary, propelling the hyper-creative Montréal scene, and beyond. Not content to parlay received wisdom, the quartet cultivates an ethos of risk-taking, and boldly venture off the beaten track. With rigorous qualitative criteria, they have nurtured a vastly diverse repertoire, unbiased by the currents of fashion.This has led to over a hundred and thirty commissioned pieces, as well as close to two hundred other premiered works. A Bozzini Quartet concert is an art happening, with meticulous and sensuous attention to detail. The Bozzini Quartet produces and presents its annual concert series in Montréal. 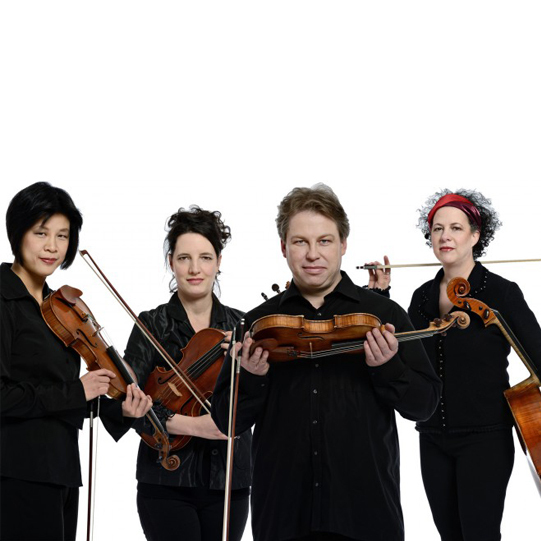 The group also tours extensively, bringing its “intense musicality and immense sensitivity” (Musicworks, Canada), to audiences across Canada, the US, South America and Europe. Notable festivals include MärzMusik (Berlin), Ultima (Oslo), Huddersfield (UK), Klangspuren (Austria), Présences (France), and November Music (Netherlands). To ensure continual development in their art, the quartet’s annual musical laboratory, the Composer’s Kitchen, works to mentor and support new generations of composers. The Bozzini Quartet records under its own label, the collection qb, and can be heard regularly on European and Canadian radio. Finalist to the 28th Grand Prix du CAM 2012, The Bozzini Quartet has won three Opus prizes from the Conseil québécois de la musique (CQM): “International Outreach” (2007), “Contemporary Disc of the Year” (2004), and “Discovery of the Year” (2001). It is also the recipient of the Étoile-Galaxie Prize from Radio-Canada (2001), the Förderpreis Ernst von Siemens Musikstiftung (2007) and the German Record Critics Prize for Arbor Vitae (2009).